Many authors use nature to analyze human nature and depict the human condition . James Joyce uses the snow to cast light on the characters, convey the meaning in the events and provide further analysis of the themes within "The Dead". Snow adding beauty to the landscape. Snow can represent beauty, for it outlines the vegetation and adds wondrous definition to their lovely shapes. 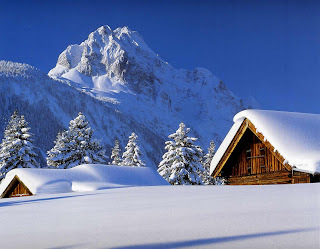 Snow also provides mankind the opportunity to rest unashamedly and comfortably. It can be seen as a symbolism of innocence and a celebration of winter. Although snow ruthlessly suffocates life from the vegetation, it aids in the cycle of life and gives a chance for new growth. Snow encourages playfulness, recreation and increased intimacy with family and friends. Snow gives humans a special strength and wit as we learn to adapt our lives around the powdery comrade and tyrant. Snow reveals its cruel and oppressive nature as it covers the plants’ ability to gain energy and nourishment from the sun. The plants hearts are froze and they are kept in perpetual darkness. The snow represents that death of these life forms. Without protection, snow is too cold to thoroughly enjoy. You must be layered in warmth to escape its painful bite. The layers are restrictive and all feeling is lost. Humans frequently blame snow for the loss of freedom and inhibition in their movement. An Analysis of the Snow in James Joyce's "The Dead"
When Gabriel first arrives it began to snow on his clothing in a gradually oppressive manner “a light fringe of snow lay like a cap on the shoulder of his overcoat”. Similarly his role in life and identity as an Irish man is a restrictive, cold and oppressing routine to him. In fact his personality is restrictive and controlling to others. He evens feels trapped by his own cautious and inhibited personality. He is an authority figure to Freddie and his education thrusts him as the powerful figure within the family. His family expects him to take the lead in the household and as the favorite niece he holds a high status. "It's such a relief," said Aunt Kate to Mrs. Conroy, "that Gabriel is here. I always feel easier in my mind when he's here.” His restricts his inner desires. Therefore he feels uncomfortable in the world and unsure of how to react or behave. His wife is a free spirit, remembers adventure, and demands more from life. This conflict is clearly seen as we witness his difficulty with communicating with women, who symbolize the Irish movement. He struggles with the idea of freedom and embracing yourself or your culture. The independent nature of the maid and the rebuke from Molly Ivors for his lack of patriotism leaves him confused and uncomfortable. He was a microcosm for many in Ireland and a representative of many today that live life insecure and defensive. Gretta wants to conquer the difficulties in life, even the routine. “She’d walk home in the snow if she were let.” says Gabriel. Walking in the snow displays victory, a lack of fear of the snow or rules and perhaps even an appreciation of the snow despite the grave dangers. Gabriel wants to provide, for Gretta and protect her from the snow with superficial warmth. But Gretta wants to face the snow head on or enjoy the fire. She is neither frail nor weak. Death of a Powerful Movement and Dulling of Strong Love. The layers Gretta must endure mirrors the same restriction that those from The Continent endure. “The snow would be lying on the branches of the trees and forming a bright cap on the top of the Wellington Monument.” The snow provides definition and attracts more attention to the Irish symbol, which evokes national pride. 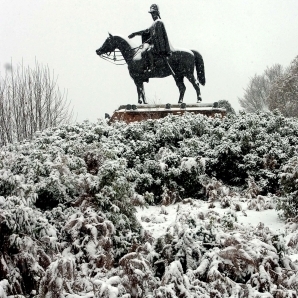 It is majestic as the snow cloaks around the monument, however the monument is not a living object. It cannot be too cold or too hurt. It’s invincible to the oppression even if the people are not. The monument’s figure gave strength to the Irish during his time. His presence lives on and the people remain in the past. Now the Irish movement is in a deadened paralyzed state. “The Wellington Monument wore a gleaming cap of snow that flashed westward over the white field of Fifteen Acres.” The snow appears before Gabriel speaks, foreshadowing the contents of Gabriel’s speech, his feeling about the speech and his influence on others. The woman, Aunt Julia enjoys snow’s appearance while Aunt Kate sees snow as a celebration. However, Mr. D’Arcy doesn’t share the same appreciation for the snow. The men feel inadequate to the forced repression. It has been the heaviest snow fall in thirty years. As the snow turns just to streaks and patches we see Gabriel’s hard softening, wanting to forget about the cares of the world. He longed to recall to her those past affectionate moments, to make her forget the years of their dull existence together and remember only their moments of ecstasy. Gretta flings herself on the bed sobbing about the dead of Michael Furey. The years, he felt, had not quenched his soul or hers. “Their children, his writing, her household cares had not quenched all their souls' tender fire.” In one letter that he had written to her: "Why is it that words like these seem to me so dull and cold? Is it because there is no word tender enough to be your name?" The statute also is not covered in snow but only in patches. But now, after “kindling again of so many memories, the first touch of her body, musical and strange and perfumed, sent through him a keen pang of lust. Under the cover of her silence he pressed her arm closely to his side; and, as they stood at the hotel door, he felt that they had escaped from their lives and duties, escaped from home and friends and run away together with wild and radiant hearts to a new adventure.” “He saw himself as a ludicrous figure, acting as a pennyboy for his aunts, a nervous, well-meaning sentimentalist, orating to vulgarisms and idealizing his own clownish lusts, the pitiable fatuous fellow he had caught a glimpse of in the mirror.” When Gretta speaks of Michael, there is no mention of snow, but instead he is like a fire. Not afraid of danger, Michael Furey the uninhibited figure, suffers a physical death. Yet his powerful memories, enduring love and strong emotions will last forever. Gabriel contemplates his wife’s words which enables him to reach an epiphany. The snow falls again, but this time, it takes on a different meaning. Passion from the past can continue into the future and paralysis doesn’t have to last forever. Many times we are oppressed by external pressures and trapped by our own pain. However we can gain inspiration through others who are fearless and dare to defy obstacles. Instead of being defensive, we can learn how embrace passion, freedom and people who care about us. Are there any epiphanies that you’ve reached through self-reflection lately? Loved this exposition on snow. Brrr. Thank you! I was assigned to write this a long time ago. I thought the teacher was ridiculous,lol. But now I understand the significance of the assignment. I never read any James Joyce, maybe I should. You definitely should. The classics are timeless and can teach up a lot about the social world and human nature. Great post! The only James Joyce I've read is Dubliners. Thank you! I enjoyed the political message in Dubliners also. Snow is a great example of how things can mean anything, depending on how the author uses them. I love how authors can use nature to provide clarity on a subject. It is also an interesting reflection in how you see something is based on how it effects you. The beauty of the landscape would be less beautiful if you were reflecting on a dwindling supply of food and you are unable to plant. However, with a full bank account and a grocery store stocked down the street it is a beautiful scene to contimplate. Very true, thanks for commenting!! The Wellington Monument is a symbol of British oppression of the Irish. It is not a symbol of Irish national pride, as stated in the article above. Therefore, in The Dead, the Monument symbolises Gabriel's alienation from Irish culture and his escapism to non-Irish European culture.